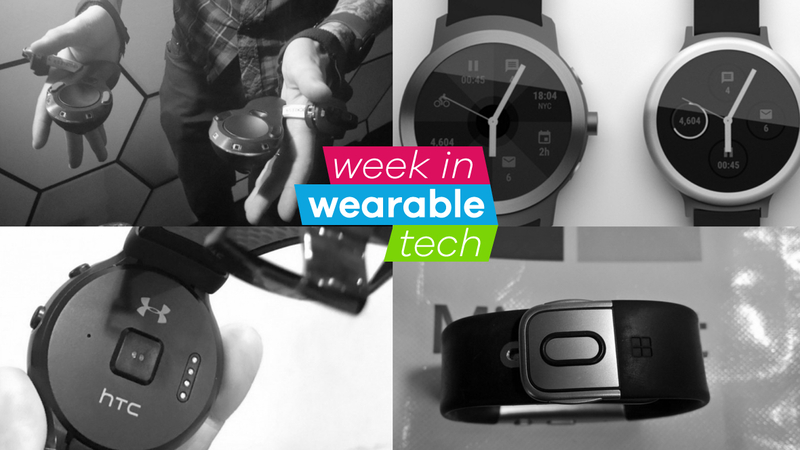 Welcome wearable lovers to your latest instalment of the big week in wearable tech. A week where the PlayStation VR officially launched, Microsoft decided to bring HoloLens to more countries, and a study suggested that the Apple Watch is the most accurate wrist based heart rate monitor. Whether you're into fitness trackers or VR, read on to get this week's wearable tech news fix. The HTC Android Wear Watch is alive. Well, that's according to leaked images that suggest HTC and Under Armour are still partnering up for a Wear watch codenamed 'Halfbreak'. Details are scarce but we're obviously looking at a circular smartwatch with a heart rate sensor present in the back. Hopefully, we'll see the finished article next year and it makes a better impression than the Under Armour Band, which HTC built for the sports company giant. Take a look at the smartwatches that are still set to drop in 2016. It looks like Google's Android Wear smartwatch duo will be landing in the new year alongside Android Wear 2.0. That's according to serial leakster Evan Blass who claims to have the the inside knowledge that the two round Wear watches codenamed Angelfish and Swordfish will launch in Q1 2017 and will be joined the latest version of Google's smartwatch operating system which was expected to launch this year. Take a look at our pick of the best smart analogue watches and the stylish Apple Watch straps you need to own. Valve is already showing off new HTC Vive hardware, including refreshed controllers and new position-tracking modules. Unlike the Oculus Touch controllers, you can completely let go of Vive's new controllers without them falling away, due to a strap that attaches to the back of your hand. The Vive makers are also expected to show to launch a new base station next year, which aims to improve tracking. Check out our PlayStation VR essential guide, plus we go hands on with the latest version of the Oculus Touch controllers. Images of what appears to be the Microsoft Band 3 prototype gave us a glimpse of what the company had been planning had it not recently decided to get out of the fitness wearable game. The series of pictures were accompanied by reported features including a waterproof design, the ability to track blood pressure, built-in EKG standard heart rate monitoring and RFID (radio frequency identification) support. No doubt there'll be one of two Microsoft Bands disappointed that this will probably never see the light of day. Fitness fans should check out our essential Garmin Watch buying guide and have a read of our Oakley Radar Pace smart specs. This week's crowdfund pick is a smart doorbell. Yes, we know smart doorbells aren't new, but the Ding promises to answer the delivery man a whole lot easier. The three-part setup includes a weather resistant doorbell button that sits near your front door, a mountable chime speaker that sits inside your home and is paired to your home Wi-Fi network, plus the companion smartphone app. When someone presses the bell, you'll be able to speak to them without going to the door. Ding has already raised more than $20,000 in its Kickstarter campaign chasing $50,000. The smart doorbell will cost you $119. If you love crowdfunding, we spoke to the makers of the LVL hydration monitor that's raising big bucks on Kickstarter and the creators of the Welt fat-fighting smart belt.